Preheat oven to 350°F. Line a 9x13-inch baking pan with non-stick foil or parchment paper. Make oatmeal cookie mix and peanut butter cookie mix according to package instructions, then combine doughs together. Use your hands to blend in the creamy peanut butter, then add the chocolate chips, butterscotch chips, candies and nuts. Press into prepared baking pan and bake 30-34 minutes. Remove from oven and allow to cool completely before removing bars from pan. Combine chocolate chips, peanut butter, and 2 tablespoons heavy whipping cream in a microwave-safe bowl. Heat on high power for 30 seconds. Let sit in microwave for 2 minutes, then stir. Microwave for 15 more seconds, then stir until completely smooth. Stir in the remaining 1 tablespoon of heavy whipping cream and drizzle chocolate mixture over the top of the monster cookie bars. Sprinkle on the remaining chocolate chips, candies and nuts. Refrigerate for 15 minutes before cutting into squares. All the crunchy, gooey goodness of monster cookies, piled high in an over-the-top cookie bar that no one will be able to resist. Have you ever had a monster cookie? You know, those thick peanut butter and oatmeal cookies loaded with gooey chocolate and butterscotch chips, candy-coated chocolates, and even some nuts. I’m guessing these cookies got their name not from that one big blue monster that can’t get enough of them, but because of their mammoth size and misshapen appearance. No, they aren’t the prettiest cookies, but they sure do taste great. 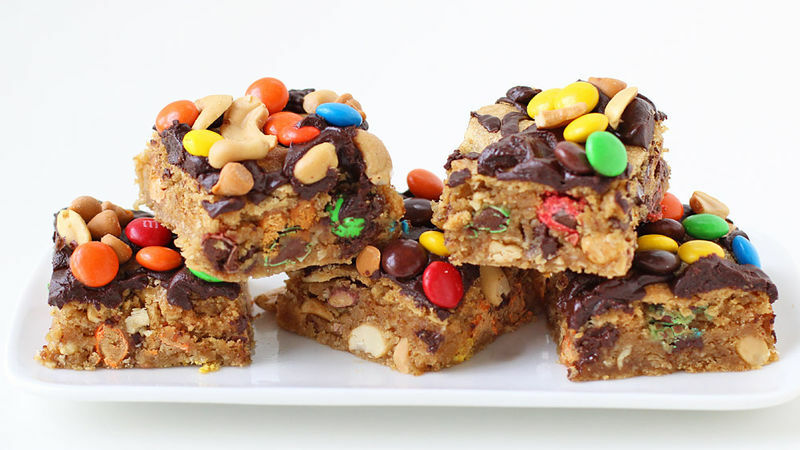 So let’s take all the wonderful things about monster cookies and turn them into a decadently rich, thick and chewy cookie bar topped with luscious chocolate peanut butter ganache and even more candy and nut toppings. Once you take a bite of one of these colossal bars, the big blue monster in you will surely break loose. You’ll be gobbling them up almost as quickly as you made them. These cookie bars are super simple to make using Betty Crocker mixes. To get that fantastic peanut butter-oatmeal cookie flavor, you’ll combine one prepared Betty Crocker Oatmeal Cookie Mix with one prepared Betty Crocker Peanut Butter Cookie Mix. Then add a little bit of creamy peanut butter to help keep the bars together once you load them up with candy and nuts. Stir in your favorite mix-ins. I chose chocolate and butterscotch chips, candy-coated chocolate pieces, candy-coated peanut butter pieces, peanuts, and cashews. If you like milk and white chocolate chips, use them instead. Love toffee? Prefer pecans? Go for it. By using two pouches of cookie mix and a nice amount of mix-ins you’ll have enough dough to make a big 9x13-inch pan of monster cookie bars. Be sure to spread the dough into an even layer in the pan before popping it in the oven. Bake until deep golden brown. These bars are thick so you want to make sure they are baked all the way through. Now you will have to tame the beast inside of you and wait until the bars cool a bit. While you wait, you can combine the chocolate peanut butter ganache ingredients in a bowl. Heat the ingredients and stir until you have a smooth and shiny ganache to drizzle over top of the bars. Then go crazy sprinkling on more candy and nuts. Don’t dig your claws into the bars quite yet; they need to chill out in the fridge first. But don’t worry, it won’t be long before you can rip (or neatly cut) into them.